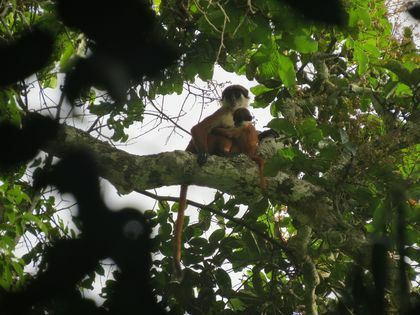 A photo of the rare Bouvier's red colobus monkey, shot in the Republic of the Congo's Ntokou-Pikounda National Park. An African monkey thought to be extinct has been spotted again by researchers, who returned from a remote Congo forest in March with the first-ever photos of the rare red primate. Until this year, scientists hadn't seen the Bouvier's red colobus monkey in the wild since the 1970s. The small primate lives in groups in swampy forests along the Congo River, in the Republic of the Congo. Hunting and logging decimated its population, leading some scientists to suggest the monkey was extinct. "Our photos are the world's first [of the monkey], and confirm that the species is not extinct," Devreese said in a statement. There are several species of red colobus monkey. Until now, scientists only knew of the Bouvier's red species from a few museum specimens collected more than 100 years ago. This particular colobus monkey shows little fear of humans - one reason it is so vulnerable to bushmeat hunters. Instead of fleeing hunters or curious scientists, the monkeys gaze at them from the trees. This makes the large groups easy pickings for the bushmeat trade, according to the Wildlife Conservation Society. "Thankfully, many of these colobus monkeys live in the recently gazetted national park and are protected from threats such as logging, agriculture and roads, all of which can lead to increased hunting," Fiona Maisels, a biologist and expert on Central Africa for the Wildlife Conservation Society, said in the statement. To find the Bouvier's red colobus monkey, Devreese and Gobolo asked locals to describe local monkeys and their calls. This helped narrow down where remaining colobus groups might live. The researchers started in the town of Owando, and then hired a dugout canoe in Makoua to traverse the Likouala River. The team made its first sighting on the Bokiba River in the Republic of the Congo's Ntokou-Pikounda National Park, an area that protects gorillas, chimpanzees and elephants. "After searching the swamps on the left bank of the Bokiba River for four days, changing camp twice - and just before running out of food, battery and courage - we finally found a group of Bouvier's red colobus monkeys on Monday," the researchers posted on Indiegogo on March 3. "What a beautiful monkey!"